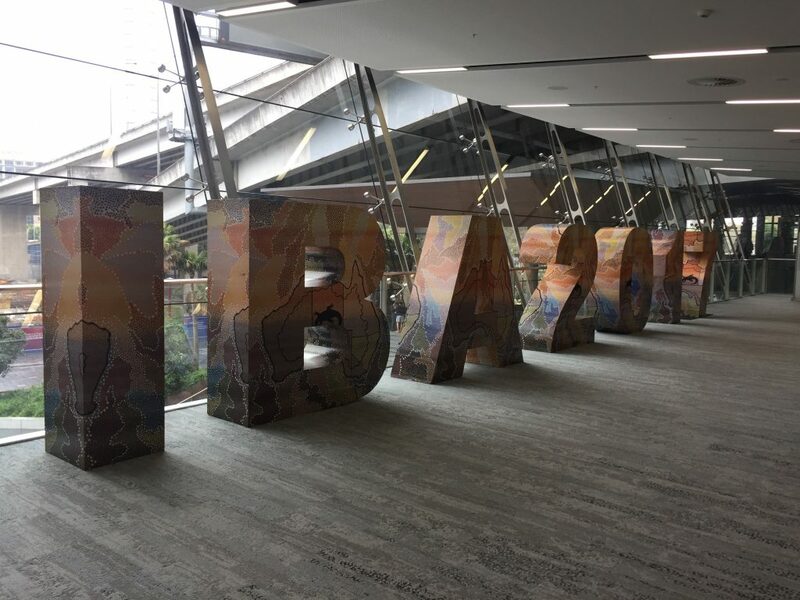 The session was one of many that day, and all week, that formed part of the amazing International Bar Association 2017 conference, which saw more than 5000 lawyers and legal advisors camping out in Sydney for the week talking about all manner of things about the future of law, the legal profession and the increasingly disrupted world that characterises their work, their future and the work and future of the clients they advise. Invited by IBA deputy executive director Tim Hughes (via Digital Analytics Centre CEO Ian Oppermann) to pull together a panel of interesting Australian contributors to the “disruption” session, as we started to refer to it, we hit the jackpot with three contributors who brought a wealth of expertise, insight and deep personal engagement with these issues. Adrian Turner (Data61), Megan Brownlow (PwC) and Kate Cooper (Westpac) turned out to be something of a dream team in this context. They managed, in barely an hour, to not only stake out the grand and constantly changing territory for our conversation, but landed too some great insights about what it might all mean. I’ve put the bio notes below for the three speakers. Artificial intelligence and machine learning might have to capacity to take jobs, or at least change bits of the work and tasks that go into a number of different jobs, but they also have a chance to make us more human. What if we’re smart and learn how to harness the disruption to augment, not diminish our humanness? Creativity, empathy, judgement – these are things we do well as humans (as I read somewhere recently, it will be a long time before robots learn about sneering or irony!) The world of artificial intelligence is already beginning to show us that the future is relational, not transactional (robots transact, however empathetically, people relate). In 20 years, will universities and TAFEs have turned into “career concierges”, taming astonishing platforms of artificial intelligence and new modes and methods of flexible, continuous learning to guide, prompt and enable almost limitless patterns of work, research and learning? The convergence of technology and the natural and health sciences is shaping unimaginable possibilities for new services, new ways of interacting with each other for work, health and learning and new ways to pay for it all (actually, they are increasingly imaginable, and people are building, testing and launching services and products to show what’s possible…) New patterns of thinking and working are emerging, being shaped, changing, being tested. Data is an asset, kind of the new oil, except that, unlike oil, it is a resource of abundance, not scarcity. A new domain – cyber-physical – is rising as a central opportunity and risk for the disrupted world. Being safe and keeping safe becomes not a peripheral, but a central and strategic business and policy concern. Algorithmic ethics (a phrase we made up on the day) are becoming more troublesome but, if we determine to approach them sensibly, could be important shapers of a disrupted world. The ethical dimension of the choices we make about machines, software, automation is becoming more widely understood but remains still too often opaque and undeclared. Sunlight (ie transparency and legibility) will be the best disinfectant here, as it is is pretty much any place we need to find out what’s going on, and why. The ethical dimensions of disruption are underplayed, much more important than we think and likely to be more influential that we might imagine in shaping its trajectory and impact. I’m coming across more writing and discussion about the ethics of disruption, often specifically pointed at the emerging capabilities of artificial intelligence and machine learning. On the principle that machines and anything artificial are designed, at least to start with, the question is according to what set of ethics and values are the programmable pieces of the puzzle being selected and pressed into service. It’s an interesting dynamic, which is maybe being played out again, that as technology innovation drives new modes of economic and social interaction (think printing, electricity, digital), we learn gradually that these inventions and brilliant breakthroughs come burdened with big ethical choices and implications. Can we do that work deliberately and with “public purpose”? Or are we helpless victims of the “inevitable” march of invention? The ground rules of the disruption game, in which we are all more or less willing players, are speed, agility and intensity. A few years ago, I wrote a small book, with former Finance Minister Lindsay Tanner, which looked at the way in which digital technologies and capabilities were forcing institutions in government, business, civil society and education to “change shape”. The problem is that many of these institutions – all of them? – are not especially adept at working with the speed, agility and intensity that keeping up with, or even keeping ahead, of the rate of change and invention demands. The truth is we design institutions NOT to change, at least in large measure, because it is in their stability and persistence that we have invested our collective faith in their wisdom and reliability. That seems less likely to be true now. Just think of banking, the media and entertainment and government as three domains represented by the panel and all, in their own ways, at the eye of many of the biggest storms of disruption. Think about how they are changing shape and learning, often with painful consequences, to dance the disruption fandango. I guess the panel suggested we can expect more of that, not less. Data point – according to one recent analysis, there were 99 ‘legal tech” patents in 2012 (patents for new legal services technologies and platforms). Five years later, in 2016, there were 579, a 484% increase. The role of government, and the coalitions of expertise and capability they will convene around some of the big policy and regulatory issues that are now emerging, will be crucial as designers and rule makers as new worlds of possibility and risk evolve, rise and transform. In this last insight, I am especially taken by the need to inject new forms and processes of “public purpose”. By that I mean the way as a society and as a global community we choose to form and give effect to a sense of purpose, direction and intent that reflect a wider set of public interests than the narrower interests of many of the players who are busy doing the disrupting. I’ve been playing with the “public purpose” language for some time, at least as far back as my work with the innovation and strategy group in Cisco’s public sector practice. It’s the title of my own practice. And it’s incorporated into the title of a new venture from University College, London – the Institute for Innovation and Public Purpose – led by Mariana Mazzucato, exploring how we rescue and perhaps relearn the skills of purpose-making for markets and policy. This video is from the official launch of the Institute last week. It rehearses some of the core propositions about the significance, role and practice of public purpose and why we need to rediscover the value and skill of mission-led innovation and policy. Markets are not forces of nature, the argument goes, in the face of whose contortions and demands we are helpless. They are designed, outcomes of decisions (or the lack of decisions) about what we want to achieve and how we want to live in the lives we share in common. That is an irreducibly “public” function. The question is how does that function get characterised and prosecuted in the contemporary world. It is the same for the conversation about disruption. Disruption happens as the consequence, the outcome if you like, of a bunch of decisions, investments and actions by all sorts of players, large and small, public and private and everything in between. Some of that happens serendipitously following lines of technological and inventive inquiry where it will go. Some of it happens by design because there are big interests and risks at play as we seek the upside opportunities. Actually, all of it, including the apparently autonomous and accidental stuff, happens because of some usually unseen set of rules, decisions and markers set down by previous decisions or actions. At some level, everything is designed or is a function of a design choice. Little, if anything, is by chance. The question, eloquently if briefly sketched by our “disruption sherpas” on Tuesday, is how we guide and shape that work to reflect, reinforce and extend the big public purpose goals and intent we must establish and constantly evolve. That is a job for all of us, not just lawyers or policy makers or technologists and entrepreneurs. All of us. Kate joined Westpac in 2016 as the Director of Innovation Services. She is res0ponsible for leading and accelerating innovation across the Westpac group. She has been Head of Social Media a few years back for the UK Government. She has also owned her own business, Bloom, focusing on social business and digital transformation. Adrian is the CEO of Data61, a CSIRO entity that is the largest data innovation group in Australia. He is a successful and influential Australian technology entrepreneur who has spent 18 years in Silicon Valley. He is also co-chair of the Australia Cyber Security Growth Network (ACSGN) and a member of the Board of Directors for the Australian eHealth Research Centre (AeHRC). Megan is partner and media and entertainment industry specialist at PwC where she performs strategy, due diligence, forecasting, and market analysis work for clients. She has over 20 years’ experience in media and marketing ranging from producing television and radio programs to designing cross-media strategies – both content and advertising – for online and traditional media properties. She edits PwC’s annual industry snapshot the Australian Entertainment & Media Outlook. Megan is also a member of the Bureau of Communications Research Advisory Committee and the Research Strategy Panel for the Australia Council.